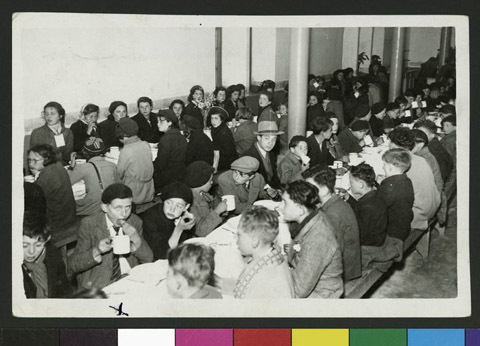 JDC - Archives : A large group eating in a dining hall and still wearing their outer garments. Title A large group eating in a dining hall and still wearing their outer garments. Description A large group of young refugees eating in a dining hall and still wearing their outer garments. Some children wear American Friends Service Committee id badges. JDC collaborated often with the AFSC during this period, particularly to help Jews in Germany, Austria, Czechoslovakia, and France.